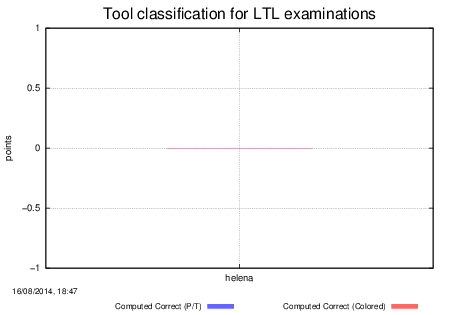 This page shows the results for the LTL examination. There are two charts. The left one shows the actual points gained by tools. It corresponds to results that were confirmed by a majority of the participating tools. The right one corresponds to honor points gained by tools. It corresponds to situations where only one tool could provide a result (it was thus not confirmed by any other one). 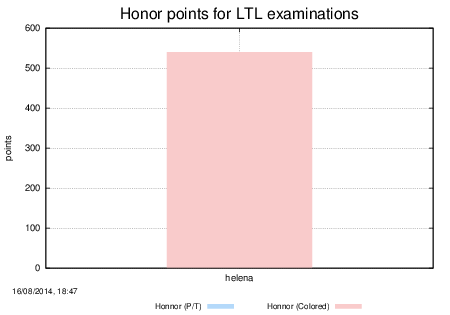 Honor points are not used to rank tools since we cannot ensure that results are corrects. Red color is for Colored nets (rose for honor points) and blue is for P/T nets (light blue for honor points). Since no model is processed by more than one tool, there is no winner in this category. Let us note that Helena (on Colored nets) gets 540 honor points. The table below shows numeric data corresponding to the charts.